Tributes have been paid to Welsh composer Alun Hoddinott, who has died at the age of 78. Mr Hoddinott, who was born in Bargoed, Caerphilly, had a partnership with the BBC National Orchestra of Wales spanning seven decades. The classical composer, who lived in Gower, Swansea, died at the city's Morriston Hospital on Wednesday. BBC Wales controller, Menna Richards, has said the new home of the orchestra in Cardiff Bay will be named after him. She said: "All of Alun Hoddinott's friends at BBC Wales are very sad at the news of his death. He was one of Wales' most distinguished and influential composers with an international reputation. "Alun Hoddinott's partnership with the BBC National Orchestra of Wales spanned seven decades. His work has been so significant and prolific that, in 2004, the orchestra undertook a year-long season of Alun's work to celebrate his 75th birthday. "Later this year the BBC National Orchestra of Wales will move into its new home Hoddinott Hall [in the Wales Millennium Centre], named in honour of such a fine composer and distinguished Welshman." 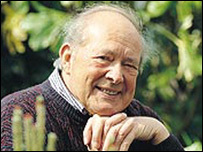 It is understood Mr Hoddinott had been in hospital since he had major heart surgery last year. David Murray, director of the BBC National Orchestra of Wales, said the composer was "inspired" by his long relationship with the orchestra, which he likened to "a long relationship of good friends". Of the new Hoddinott Hall, which will allow a live audience of up to 350 to watch the orchestra perform, Mr Murray said: "It is very sad he won't see the building, but we will make sure his spirit and his music lives on in that building." Huw Tregelles Williams, who became the first director of the BBC National Orchestra of Wales in 1992, said Mr Hoddinott created an "entirely new musical language". "He had great early success, of course," he said. "He had a highly original, colourful style. Many of his scores, very colourful scores, filled with exciting percussion sounds, new brass sounds and so on - an entirely new musical language in the history of musical Wales." 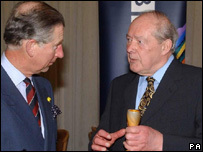 Mr Hoddinott, a former Cardiff University music professor, had a distinguished career. After graduating from Cardiff University, he studied for some years with the Australian composer and pianist Arthur Benjamin. He was awarded the Walford Davies prize for composition when he was 24, and achieved his first national success a year later, when his Clarinet Concerto was given its first public performance at the Cheltenham Festival. He went on to become a renowned composer, with commissions for his compositions coming from leading orchestras and soloists, including Dame Margaret Price and more recently Jeremy Huw Williams. In 1951, he was appointed lecturer in music at the Welsh College of Music and Drama. He later became a lecturer at Cardiff University and was made professor and head of department there in 1967. Among his many awards were the John Edwards Memorial Award, the Arnold Bax Medal for composers, the Hopkins Medal of the New York St David's Society and the CBE. He was an honorary member of the Royal Academy of Music, and a fellow of the Royal Northern College of Music. In 1997, Mr Hoddinott received the Glyndwr Award for an Outstanding Contribution to the Arts in Wales during the Machynlleth Festival. He also received a Lifetime Achievement Award from the Arts Council of Wales in 1999, Fellowship of the Welsh Music Guild and the Queen presented a medal to him as she officially opened the Wales Millennium Centre. In 2005, he produced a fanfare to be performed at the wedding of the Prince of Wales to Camilla Parker Bowles. He had previously composed music to mark the prince's 16th birthday. As artistic director of the Cardiff Festival, which he co-founded with his friend, the pianist John Ogdon, Mr Hoddinott has had considerable influence in awakening interest in contemporary music in south Wales.